North Korean leader Kim Jong-un and US President Donald Trump arrived Sunday in Singapore ahead of their first-ever summit on Tuesday. 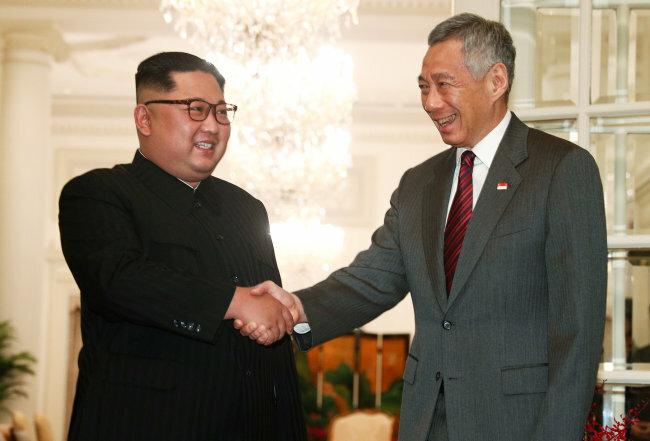 After landing at Singapore’s Changi Airport shortly at around 2:40 p.m., Kim met with Singaporean Prime Minister Lee Hsien Loong at the Istana Presidential Palace and expressed gratitude to Lee for hosting event. “If the meeting between North Korea and the US become successful, Singapore’s efforts to host the meeting will go down in history,” said Kim during the meeting attended by Kim’s entourage including his sister Kim Yo-jong. In response, Lee thanked Kim for attending the summit in Singapore. The summit will take place Tuesday at 9 a.m. at the Capella Hotel on the resort island of Sentosa, off Singapore’s southern tip. Trump arrived at Singapore’s Paya Lebar Airbase and went to the Shangri-La Hotel after departing from the Group of Seven meeting in Canada on Saturday, where he described the summit as “mission of peace” to offer a “one-time shot” for North Korea. 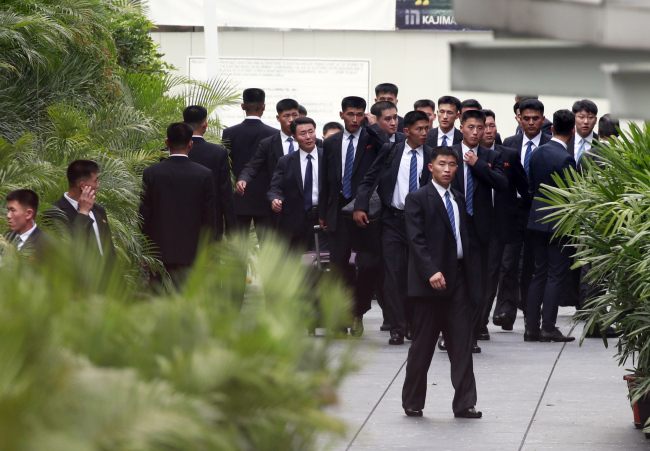 The two leaders’ arrival to Singapore came amid the speculation that the summit would be a one-day event, as the North Korean leader is expected to depart Singapore hours after the summit ends. Citing an anonymous source involved in the planning of Trump-Kim summit, Reuters reported that Kim Jong-un would leave the city state at 2 p.m. The departure plan is still tentative, the source added. 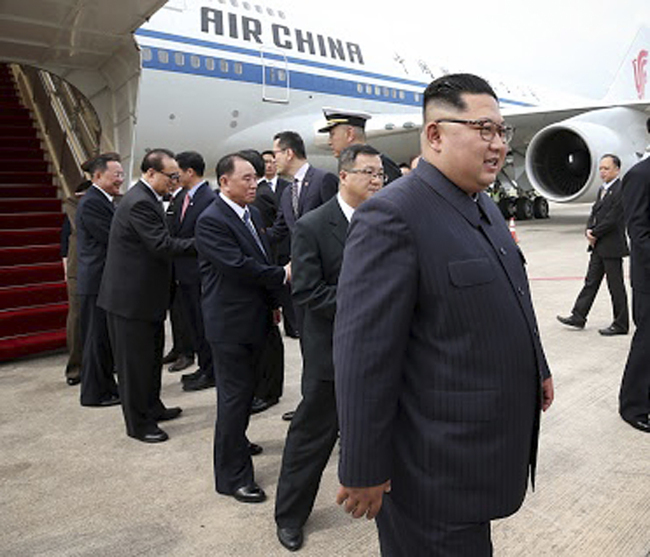 Although the reclusive leader’s Soviet-era private jet was reported to have left Pyongyang on Sunday morning, Kim appeared to have flown to Singapore on an Air China Boeing 747 usually used by senior Chinese officials. Kim’s private jet is reportedly carrying his sister Kim Yo-jong. The Trump-Kim summit is expected to mark the climax of the fast-paced diplomacy on and around the Korean Peninsula, but challenge looms large over how they would close gaps stemming from decadesold mistrust and animosity. Washington is insisting the North surrender its weapons in a complete, verifiable and irreversible way, while Pyongyang has balked at the idea of unilateral disarmament and demanded US commitment to guaranteeing the regime’s security in exchange for abandoning nuclear arsenal. The South Korean government, which has played a meditation role for the US and North Korea to hold their first-ever summit, expressed hopes that the meeting will ensure peace and stability on the Korean Peninsula. When asked about whether President Moon Jae-in would travel to Singapore to join the Trump-Kim summit at the last minute, the official said such a scenario was “highly unlikely,” downplaying the possibilities that Moon would be invited for a trilateral summit. Instead, the government dispatched Nam Gwan-pyo, a deputy director of its National Security Office, and other senior officials. Nam will brief about the government’s position after the US-North Korea summit ended, Cheong Wa Dae said. The Moon administration had hoped to hold a separate trilateral summit in Singapore and use it as an opportunity to officially declare an end to the Korea War – a symbolic move to replace the current armistice with a peace treaty. “While watching the situation closely, we will maintain close coordination (with officials those holding US-North Korea summit),” Nam told reporters before boarding the plane heading for Singapore.